As early as the 1950’s French mathematicians such as Andre Weil and Laurent Schwartz spent long periods visiting the University of Sao Paulo. Mathematical cooperation between the two countries became intense in the 1970’s when brilliant young French mathematicians performed their military service as “coopérants” at IMPA. Bilateral cooperation has grown substantially over the years, so much so that it is fair to say that each of the countries is now a major scientific partner to the other in the field of Mathematics. The Fields Medal awarded in 2014 to Artur Avila, who holds a dual appointment at IMPA and at the University of Paris, is a great token of this partnership. 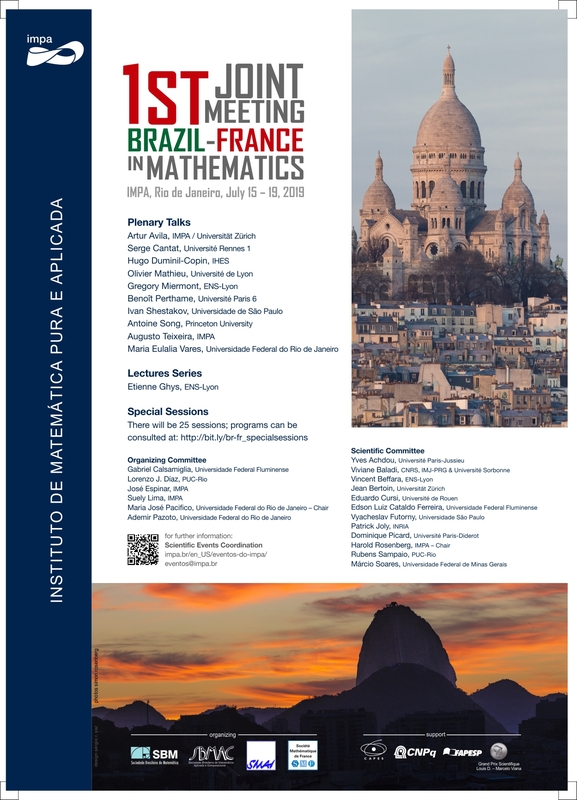 The mathematical societies of Brazil (SBM and SBMAC), and France (SMF and SMAI) have decided to bring together mathematicians from the two countries, especially young researchers, to consolidate and renew the cooperation established over the years. The meeting will take place at IMPA, Rio de Janeiro, July 15-19, 2019.